In the Wu-Tang solo albums chronology, this album was released after Raekwon's Only Built 4 Cuban Linx... and GZA's Liquid Swords. Talk about a triple threat, not to mention the heyday of the Wu. This would be the final Wu-related release before the immeasurably underrated Wu-Tang Forever, and so it wrapped up the legendary first slew of releases from the individual members of the Clan. I remember the day I bought this LP like it was yesterday. I must have already had a dub of the tape, but I remember desperately wanting the vinyl, and not being able to locate it in Eugene, the city I was living in at the time. I was headed up to Portland to pick up my girlfriend from the airport, who had been in South America for three months. I'm sure she couldn't have been more excited when I told her I had to stop by 2nd Avenue Records downtown to procure these two slabs of Ghostface on wax. But she agreed, and I shelled out the dough for the fancy-pants gatefold double LP. I had been increasingly obsessed with Cuban Linx for the past year (one of the only tapes I've ever literally played until it broke), and had grown quite fond of guest star Ghostface Killah. 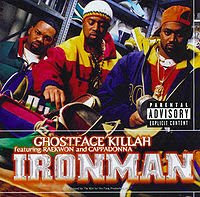 Ironman may as well have been titled Only Built 4 Cuban Linx...Part Two (speaking of, we're apparently going to see that soon), because it features the same players (Raekwon, Ghost, and Cappadonna), and in that aspect, it can't help but maintain a similar feel. However, through RZA's swift production, this album definitely stands alone as a Ghostface-manned joint, with tracks that blend together well and somehow don't really bleed over too much into Linx territory, though Raekwon is featured on the majority of the songs (even doing "The Faster Blade" by himself). I always got the vibe that this wasn't received as positively as some of the other Wu solo records, but that might be my own skewed perspective. Cuban Linx was almost impossible to stack up against, and maybe that's why this doesn't get the level of praise that Raekwon's masterpiece does. It could also be a result of this record losing a bit of steam in the final few tracks. But, the opening 3/4's is untouchable, more than making up for the way it slightly sputters in the tail end. Conversely, maybe it only seems to sputter at the end because the rest of the record is so strong. Or maybe I'm analyzing it all to closely. Whichever way you want to shake it, if Cuban Linx got me excited about the mic prowess of Ghost, this record put him over the top as my favorite Wu MC. Tracks like "Iron Maiden" and "Winter Warz" are legitimate Wu-Tang classics, hearkening back to a day when that term wasn't thrown around with such haphazardness. "Camay" is a bit of a sexing-up-the-ladies cut, but I've always loved the rhyme styles in it. "Wildflower" is just, well, not only a gutsy track to put second in the sequence of the album, but one of my favorite all-time Ghostface stream-of-consciousness verbal assaults. I could write paragraphs about the perfection that is "Daytona 500." Whenever people ask me what kind of rap/hip hop I like, I don't know why I don't just direct them to that track. It's got everything I like: a fast beat, three dudes trading verses, and a hook that just owns it. I used to know all the words to this song (or my loose interpretation of the lyrics), and have bumped it while driving far too many times. As much as I think the Speed Racer video is kind of quirky-cool, I would have much preferred a clip featuring all the dudes spitting their words. You can't win 'em all. So while I may cut this one off before it's run its course, I've definitely rocked the rest of it too many times to count. And I will continue to do so. I remember skipping school with Cdog to go buy this at 10am when the store opened. I will never forget popping it in his truck, listening to the long intro with the kid talking, which just kept building the momentum, and then hearing "Iron Maiden" kick in. Words can not describe the sheer joy that this moment brought me. The crazy thing was that each song kept impressing me (until the last few as you mentioned), something which very few rap albums have done since. I have heard this album thousands of times and still hear new things on it when I listen to it now. The beats are some of the best ever ("Iron Maiden," "260," "Assassination Day," "Fish," "Daytona 500," "Black Jesus") and all the emcees bring their A-game. This album had every thing I loved about the Clan at the time. The rhymes were corny and seemed to mean a lot to THEM. The beats were insane. Absolutely no R&B. There also seemed to be a real sense of unity and unselfishness. Ghostface only has 2 solo songs and he's not even on 2 other songs. I loved this. The Wu-Tang were on top of their game on this one. I meant to say "The rhymes were NOT corny..."